Dave enjoys and then forgets the vast majority of what I give him to eat. And how not to? I make so many different things that even I’m surprised sometimes when I scan through old unused pictures (two types of cucumber salad? orange-glazed tofu? raspberry muffins? The pictures prove I made these things, but I don’t remember any of it). But once in a while, I make something that stands out to Dave enough to not only remember it, but request it again and again, even years later. I hadn’t made this pie in two years, but once berries start to come into season, Dave starts asking about it. Often, fresh fruit pies are associated with the gel-shellacked versions you get in buffet lines. This pie replaces that gel with the barest coating of fruit jelly, which gives the fruit a beautiful shine without adding any flavorless goo. Instead, a layer of fruit puree holds the filling together while intensifying the bright berry flavor. With ripe sweet berries and a dollop of freshly whipped cream, it’s no wonder this dessert is so memorable. 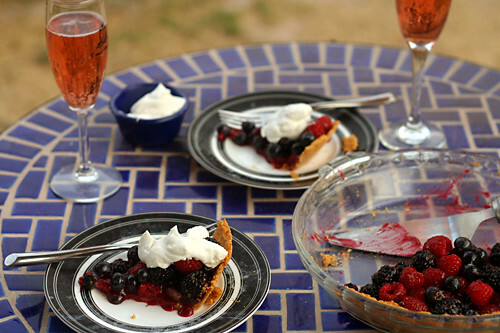 Currant jelly is smooth and bright red, so very attractive in this pie. However, I didn’t want to buy it because I don’t use it for anything else. I used raspberry jam, which I probably should have strained but didn’t. 1. FOR THE CRUST: Adjust an oven rack to the middle position and heat the oven to 325 degrees. In a food processor, process the graham crackers until evenly fine, about 30 seconds. You should have one cup of crumbs. Add the sugar; pulse to combine. Continue to pulse while adding the warm melted butter in a steady stream; pulse until the mixture resembles wet sand. Transfer to a 9-inch glass pie plate; use the bottom of a ramekin or measuring cup to press the crumbs evenly into the bottom and up the sides. Bake the crust until fragrant and beginning to brown, 15 to 18 minutes; transfer to wire rack and cool completely while making the filling. 2. FOR THE FILLING: Combine the berries in a large colander and gently rinse; spread the berries on towel-lined rimmed baking sheet and gently pat dry with additional towels. 3. In a food processor, puree 2½ cups of the mixed berries until smooth and fully pureed, about 1 minute. Strain the puree through a mesh strainer into small nonreactive saucepan, scraping and pressing on seeds to extract as much puree as possible (you should have 1¼ to 1½ cups). Whisk the sugar, cornstarch, and salt in a small bowl to combine, then whisk the mixture into the puree. Bring the puree to a boil over medium heat, stirring constantly with a wooden spoon; when the mixture reaches a boil and is thickened to consistency of pudding, remove from heat, stir in the lemon juice, and set aside to cool slightly. 4. 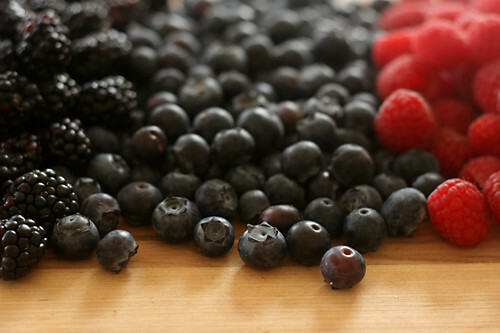 While the puree is cooling, place the remaining berries in a medium bowl. Heat the jelly in a second small saucepan over low heat until fully melted; drizzle the melted jelly over the berries and gently toss them together until the berries are glazed. Pour the slightly cooled puree into the cooled pie shell and smooth the top with a rubber spatula. 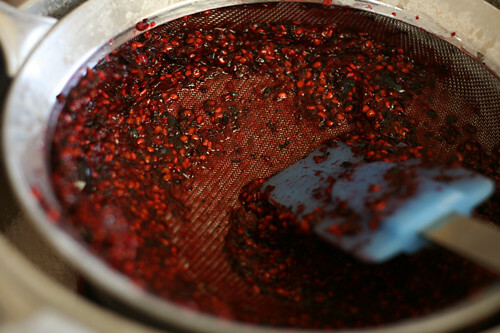 Distribute the glazed berries evenly over the puree and gently press into the surface. Loosely cover pie with plastic wrap; refrigerate until chilled and the puree has set, about 3 hours (or up to 1 day). 5. FOR THE WHIPPED CREAM: Add the cream, sugar, and vanilla to the chilled bowl of an electric mixer. Beat at low speed until small bubbles form, about 30 seconds. Increase the speed to high and continue beating until the cream is smooth, thick, and nearly doubled in volume, about 20 seconds for soft peaks or about 30 seconds for stiff peaks. If necessary, finish beating by hand to adjust the consistency. Your photos reallllllly make me wish I like pie! I may still have to make this just for my friends to enjoy! This looks fantastic and very fresh—I absolutely hate fruit pies that have that thick, sickening sweet gel filling—totally ruins the berry taste. 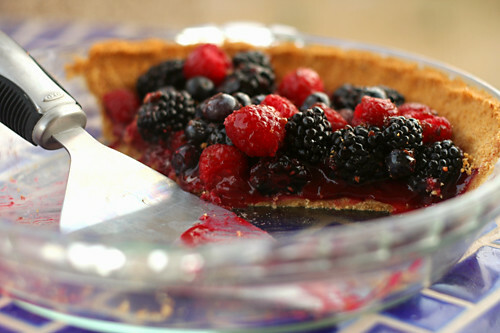 I’m going to make this as soon as I hit the farmers market and get some fresh berries. 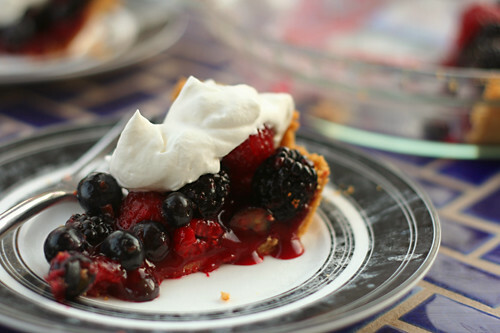 This pie looks delicious – perfect for summer! I love when I click onto a site and am inspired to take a familiar recipe and change it around a bit for a whole new experience. That is just what happened this afternoon when I found the delightful recipe for a summer berry pie. I have been making my mother’s fruit crisp recipe in 10 x 13 pans (for potlucks) and 8 x 8 for smaller dinner gatherings . . . I realized when I visited your site that with a few modifications, it would make a delicious summer pie. Thanks for posting this (and for the inspiration)! This looks lovely for the summertime. I have one worry though. Would the graham cracker crust become soggy with the warm filling placed in it? Did you experience that problem or maybe you ate it quickly enough that it was fine? Stunning! I love the photos!